Radiographs, or X-rays, are one of the most common and useful diagnostic tools in medicine, because of their ability to penetrate tissues and show your pet's organs and bones. We use state-of-the-art digital radiology equipment which means less exposure to pets, better and clearer x-rays, and the availability to consult with boarded radiologists for a second opinion if needed. X-rays allow us to assess bone fractures and abnormalities, soft tissue problems, orthopedic issues, and more. Digital radiology also provides the ability to perform full-mouth x-rays of the jaws and teeth during dental procedures to probe for underlying bone loss, infection, or tooth fractures. 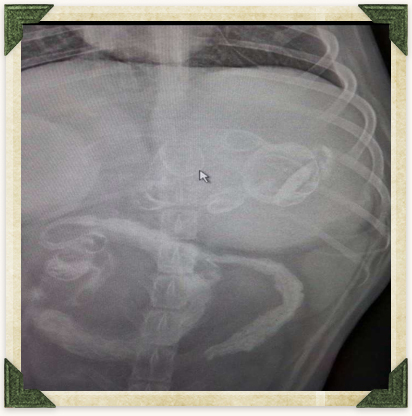 Advanced diagnostic capabilities are an extremely important part of veterinary medicine, especially since we can't simply ask our patients what is wrong. What doesn't belong in this X-Ray? Can you find the teddy bear?